Fire Chief Andrew Kingsbury is retiring in March. WESTPORT — The Fire Department will transition to new top leadership this year, as the town’s more than yearlong study of the department, its needs and future is nearing its conclusion. Chief Andrew Kingsbury will retire March 1, succeeded by Assistant Chief Robert Yost. Deputy Chief Robert Kepchar’s retirement becomes effective May 31, though he will continue in an advisory role until the fall. With Yost set to take the lead as chief in under two months, the results of a town study of fire services are expected soon. The Fire Department Strategic Planning Steering Committee has led the undertaking, beginning work in the fall of 2015. The study is assessing the department’s current status — from equipment and facilities to training and staffing — and planning for focus down the road. The impending results can offer guidance for initial goals as the leadership shifts, after what Kingsbury said has been a long, intensive study process. “I think it’ll give us a blueprint of where to move forward, and it’ll give Assistant Chief Yost — as he’s moving in — a guideline on where to head,” Kingsbury said. March 1: Chief Andrew Kingsbury’s retirement becomes effective, and Assistant Chief Robert Yost takes over as chief. Kingsbury is set to be sworn in as Nichols Fire Department Chief in Trumbull around the same date. May 31: Deputy Chief Robert Kepchar retires. The department has yet to select his successor, but a Westport firefighter will likely be promoted to the position. September: Kepchar will continue with the Fire Department in an advisory role until the fall. Since 2011 Kingsbury has been Westport’s fire chief and emergency services director. He was promoted after serving in the assistant chief training officer role, the same post Yost currently occupies. Much of his efforts at the department’s helm concerned a series of storms, including hurricanes Sandy and Irene, and Winter Storm Nemo, from 2011-2013. Kingsbury said responding to the Presidentially declared disasters and the ensuing recoveries was a defining effort of his leadership. 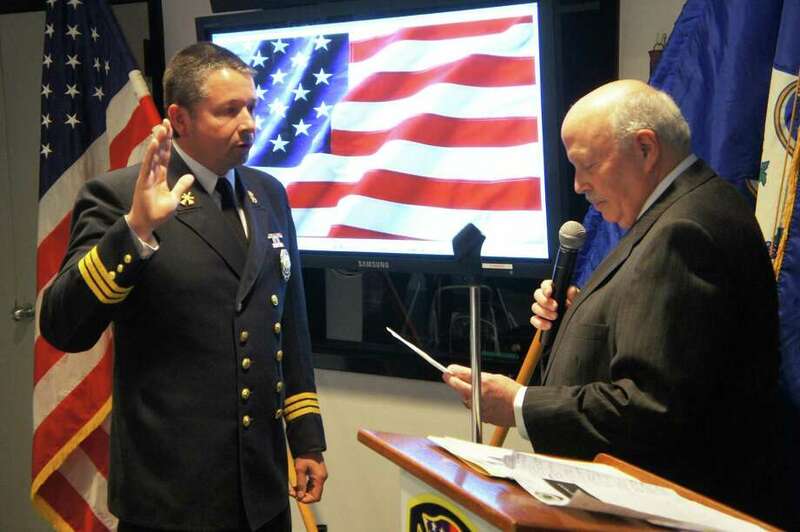 After a total of 31 years in Westport’s department Kingsbury will take over as chief of the Nichols Fire Department in Trumbull, where he lives. Kingsbury was approached for the job, slower-paced than his current post. He will be sworn in around March 1, when he officially retires in Westport. His successor, Yost, began firefighting in 1986 and joined the Westport Fire Department two years later. Yost followed Kingsbury’s path in the past, taking over as assistant chief in the training officer role when Kingsbury was promoted in 2011. As training officer, a high-ranking role in the administration, Yost was in line for the job since the Deputy Chief deferred, planning to retire not long after Kingsbury. Yost also has a family background in firefighting. His father served as Fire Chief in Norwalk for two decades, and a photo of his grandfather, also a firefighter, sitting atop a Norwalk firetruck adorns Yost’s desk. The department keeps staff engaged to have succession planning, Kingsbury said, and Yost has been attending town meetings for several years, often an element of the chief’s job. With his impending promotion, he is beginning to take on some presentations to town boards, part of an effort to heavily involve him as the process begins. Promotions are standard for Westport’s department, based on a belief the transition is smoother and quicker with firefighters that have worked in the department’s system and are familiar with its inner workings. Taking over what he called a well set-up department, among the top in the state, Yost will look to continue that work and expects no major changes outside of those called for in the findings of the ongoing town study. Yost did say he will look to ensure the fire education program in Westport schools — reinstated by the department last year — continues, emphasizing the importance of the department’s fire prevention program. Kepchar, retiring after 38 years, will be replaced — likely internally — when his retirement draws nearer.